Enansi Kelp Foot Creme is simply delicious on your feet. Made with all natural ingredients of unrefined shea butter, aloe vera butter, sea kelp and eucalyptus oils. Enansi Kelp Foot Butter is simply delicious on your feet. Made with all natural ingredients of unrefined shea butter, aloe vera butter, sea kelp and eucalyptus oils. 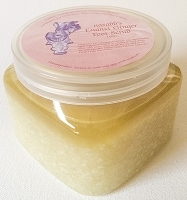 Enansi foot butter is easy to apply, moisturizes and soothes your feet. Simply massage a generous amount unto your feet. Slip on a pair of socks for extra warmth and comfort. For optimal effect precede with Nasabb's Enansi Green Tea Foot Bathe and Nasabb's Enansi Ginger Foot Scrub. Your feet are your main transportation mode. It takes you anywhere and everywhere you direct it to go. You keep them stuffed in shoes all day with no circulation. When was the last time you gave them a good loving massage? You must take care of them. Enansi Foot Creme does just that. All natural ingredients. No preservatives, chemical or synthetic ingredients.